And they gave praise to the Lord, answering one another in their songs and saying, For he is good, for his mercy to Israel is eternal. And all the people gave a great cry of joy, when they gave praise to the Lord, because the base of the Lord’s house was put in place. Praise the Lord for the base of the Lord’s house is in place. The stone that the builders refused is in place. Blessed be our Lord for the base of our house has been established. Blessed be our Lord in Jesus mighty name Amen. Ezra chapter tree, Ezra chapter 3, the book of restoration, Ezra. Where the people are restored onto their land, onto the Lord. Where the Lord is Lord of Heaven and Earth. Where God’s word has a place in everything, in all things, not in some things yes and other things no. God’s word has a place everywhere in all things, blessed be our Lord. Ezra 3 verse 11: And they gave praise to the Lord, answering one another in their songs and saying, For he is good, for his mercy to Israel is eternal. And all the people gave a great cry of joy, when they gave praise to the Lord, because the base of the Lord’s house was put in place. Blessed be our Lord, blessed be our Lord. When the Lord’s foundation is reestablished all things work to further his work, His word having the most prominent place in all things; for he is the head of all things. Blessed be our Lord. And especially when you have enemies, then the safest course is to be a house of the Lord, is to have that foundation, that stumbling-block. Praise the Lord for the base of the Lord’s house is in place. Lord give us your word, speak with your voice, speak into the hearts of those who are under the power of your voice, in Jesus mighty name, Amen. So when the seventh month came, and the children of Israel were in the towns, the people came together like one man to Jerusalem. Then Jeshua, the son of Jozadak, and his brothers the priests, and Zerubbabel, the son of Shealtiel, with his brothers, got up and made the altar of the God of Israel for burned offerings as is recorded in the law of Moses, the man of God. They put the altar on its base; for fear was on them because of the people of the countries: and they made burned offerings on it to the Lord, even burned offerings morning and evening. And they kept the feast of tents, as it is recorded, making the regular burned offerings every day by number, as it is ordered; for every day what was needed. And after that, the regular burned offering and the offerings for the new moons and all the fixed feasts of the Lord which had been made holy, and the offering of everyone who freely gave his offering to the Lord. From the first day of the seventh month they made a start with the burned offerings, but the base of the Temple of the Lord had still not been put in its place. Don’t forget the words of the Lord God of hosts “mercy I want, not offerings” the offerings are a sign for people want a sign, always want a sign, “I need to know, a sign”, he gave them as a sign to make offering, but a sign is not the true thing and so the Word of God says “mercy I want, not offerings” for what God does is offer mercy, mercy. Before anything is done, before anything is fixed in your life, the base, the foundation, that stone that the builders refused must be put into place. Ezra 3 verse 7: And they gave money to the stoneworkers and woodworkers; and meat and drink and oil to the people of Zidon and of Tyre, for the transport of cedar-trees from Lebanon to the sea, to Joppa, as Cyrus, king of Persia, had given them authority to do. Now in the second year of their coming into the house of God in Jerusalem, in the second month, the work was taken in hand by Zerubbabel, the son of Shealtiel, and Jeshua, the son of Jozadak, and the rest of their brothers the priests and the Levites, and all those who had come from the land where they were prisoners to Jerusalem: and they made the Levites, of twenty years old and over, responsible for overseeing the work of the house of the Lord. Then Jeshua with his sons and his brothers, Kadmiel with his sons, the sons of Hodaviah, together took up the work of overseeing the workmen in the house of God: the sons of Henadad with their sons and their brothers, the Levites. And when the builders put in position the base of the Temple of the Lord, the priests, dressed in their robes, took their places with horns, and the Levites, the sons of Asaph, with brass instruments, to give praise to the Lord in the way ordered by David, king of Israel. And they gave praise to the Lord, answering one another in their songs and saying, For he is good, for his mercy to Israel is eternal. And all the people gave a great cry of joy, when they gave praise to the Lord, because the base of the Lord’s house was put in place. You see before anything is done, before anything is fixed in your life, the base, the foundation, that stone that the builders refused must be put into place. And they had a great feast with great joy because the base of the Lord’s house was put in place. So that in the ears of the people the cry of joy was mixed with the sound of weeping; for the cries of the people were loud and came to the ears of those who were a long way off. Blessed be our Lord and may your cries of joy never be overshadowed by your own weeping. Blessed be our Lord and may your cries of joy never be overshadowed by your cries of weeping. 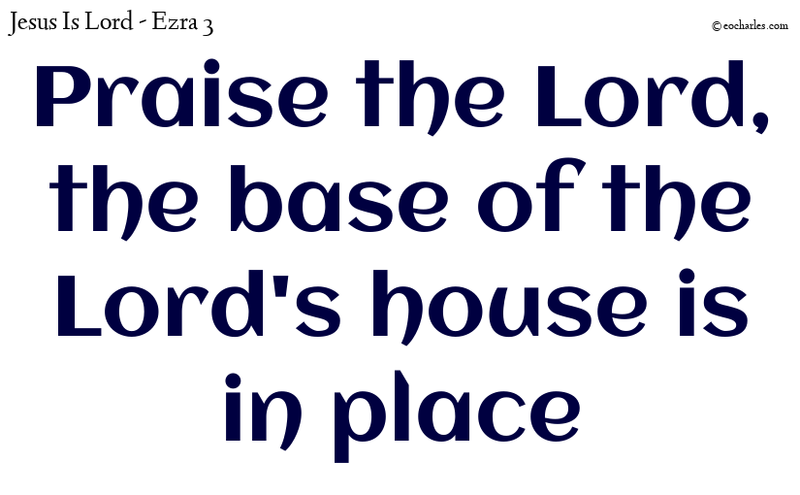 Praise the Lord, the base of the Lord’s house is in place. In the beginning was the word and that word is. His name is Jesus, light of the world. His name is Jesus, God with us.